As we set up your you@winterhavenschool.org account, one of the most important things you need is EMAIL FORWARDING. Without forwarding, you can't receive email from us to your preferred email account. Look at the upper right corner of the browser. Enter the provided you@winterhavenschool.org Username and Password. Save your changes and you have set up forwarding to the email address of your choice! Classroom.google.com is used and managed by teachers to track homework (most kids have their own login). PTSA email lists are now managed by Google email / Google Groups. 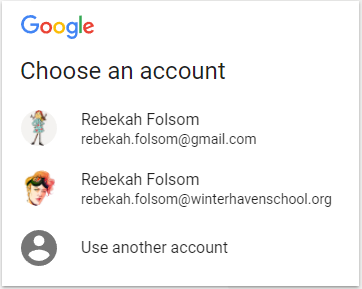 At the start of the school year, each parent was given a unique domain ID and a password (firstname.lastname@winterhavenschool.org). This User ID is required in order to make the school and classroom email lists work, but in most cases, we set up these accounts to automatically forward all PTSA email to the email address parents provided on the PTSA Communication Permission form they filled out and submitted at the start of the year. There have been a few exceptions due to technical conditions or admin errors – please email admin@winterhavenschool.org if forwarding doesn’t seem to be working. Additionally, a few parents aren’t in the system.